Burlington, Ontario. Whole Foods. I like to stop here and enjoy their vegan baked goods, including blueberry muffins and an amazing chocolate cake (even non-veggies love it). Photo of flowers is a picture of the flowers on their window, a la Richard Prince. 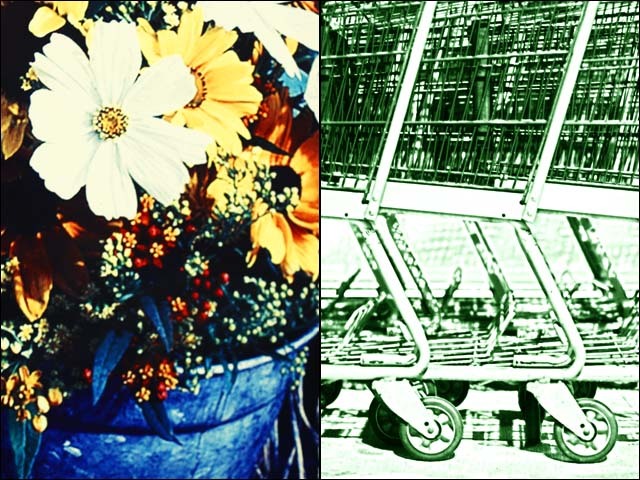 Shopping carts were souped up in Photoshop. Camera: Canon EOS 50D Lens: Canon EF 50mm f1.4 Light: Existing ISO: 800 Exposure: f2 @ 1/30 sec.